VAIL, Colorado – With Vail’s future in mind, the town of Vail issued $11.9 million in bonds in 2010 under the Vail Reinvestment Authority. The town is celebrating the use of some of those funds Thursday with the grand opening of the Lionshead Welcome Center and Transit Center. The town issued the bonds in advance of a November 2010 election that included two ballot questions that would have reduced local governments’ ability to incur debt. The statewide ballot questions failed, but Vail issued the bonds prior to the election and will repay the debt with tax-increment financing revenue over 20 years. The Lionshead Tax Increment Financing District has generated about $8.2 million in incremental property taxes from new construction within the district. The total interest cost is 4.2 percent, which was the result of combining tax-exempt bonds with taxable Build America bonds to minimize interest. The bond proceeds are also funding the renovation of the Vail Public Library and streetscape improvements on the east and west sides of the entrance to Lionshead. The bond proceeds will also fund a future reconstruction of Sundial Plaza in the Lionshead Mall. At an August 2010 meeting, Jonathan Heroux, managing director of public finance for the investment banking firm Piper Jaffray, told the Vail Reinvestment Authority, which consists of the same members as the Town Council, that municipal bond rates were approaching 30-to-40-year lows. In September 2010, the Town Council picked a three-story design for the welcome center that to include a community space, including 1,500 square feet of indoor space and 900 square feet of outdoor patio space that could host various groups and events. The Lionshead Welcome Center replaced the 30-year-old building on the south side of the Lionshead parking garage. The new, 10,600-square-foot building was designed to serve as a portal and a “first touch-point for guests coming to Vail,” according to a news release sent by the town of Vail Wednesday. “This dynamic building consolidates a number of guest services on the ground floor all arranged around a community ‘living room,'” the news release said. 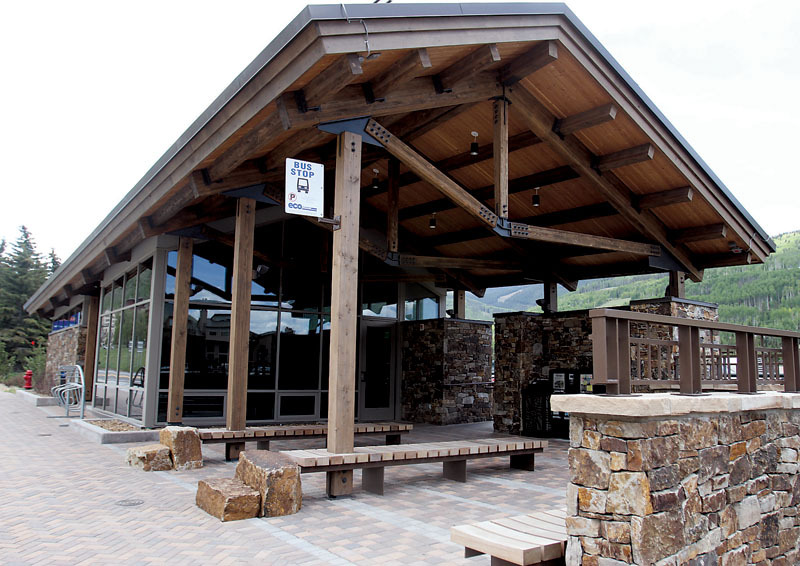 The second floor of the building features Vail Recreation District programming for children and adults, while the third floor houses the community room with grand views of Vail Mountain, as well as a roof terrace. The Lionshead Transit Center, located on the north side of the Lionshead parking garage along South Frontage Road, is a simple building that includes a bus waiting area, restrooms and an exterior waiting area. Daly calls the new buildings a tribute to Vail’s earlier leaders who laid the groundwork for Lionshead’s redevelopment. Assistant Managing Editor Lauren Glendenning can be reached at 970-748-2983 or lglendenning@vaildaily.com.